The four contestants in this year's Mrs. America pageant are calling for an apology from the pageant's owner over accusations he used racial slurs and stereotypes in a conversation, pose for photos, in New York, Monday, Oct. 15, 2018. 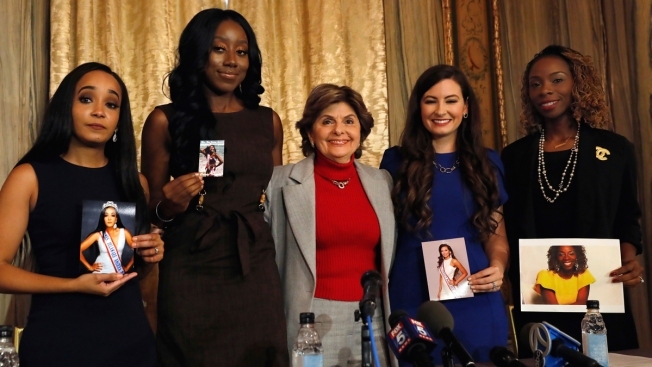 They are, from left: Mrs. Delaware America Kimberly Phillips, Mrs. New Jersey America Crissy Timpson, attorney Gloria Allred, Mrs. Ohio America Jeri Ward, and Mrs. Missouri Brandy Palacios. Four contestants in this year's Mrs. America pageant on Monday called for the pageant's CEO to apologize over accusations he used racial slurs and stereotypes in a conversation at a contest-related event. Allred said that while her clients don't intend to file a lawsuit, but they do want Marmel to apologize and implement an action plan including sensitivity training. "They have decided that it would be wrong to stay silent about this matter," Allred said. "They feel it is their duty to share what they allege was their experience, because they do not want next year's contestants to be subjected to what they consider to be racially offensive and demeaning comments which have hurt them and caused them so much pain." Crissy Timpson, Mrs. New Jersey, said the party was actually the second time she had heard Marmel's comments, and that he had said them to her a couple of days before when she arrived in Las Vegas for the pageant. "Originally we weren't going to say anything because we all thought who would believe us," she said. "If we came forward after the pageant, people would think we were just upset about either not winning or placing the way we wanted." "If there's an apology, they owe Mr. Marmel," he said.